The Admissions Office will be closed from December 24 at noon until January 1 (we will reopen January 2). During the closure, we will not be here to answer emails or phone calls. Please contact us before the holidays if you have questions or need help. As always, we are impressed with our applicants’ academic and non-academic achievements, and regret that we cannot invite more of you to interview. Unfortunately, we cannot provide individual feedback on your application, but we hope this explanation of scores can help to answer some of your questions. There are some FAQs below as well. AQ Score = OGPA (if not eligible for AGPA) or AGPA, converted to a number out of 50 (50 is the maximum score). The AQ score is just your OGPA or AGPA, automatically converted to a number out of 50 by our application system. The exact conversion mechanism is confidential. It is important to emphasize that the calculation is automatically determined. This means if your OGPA/AGPA is correct, your AQ score is also correct. If you are a reapplicant and your AQ score is different from last year, that’s ok; the scores are standardized against the current applicant pool, which changes from year to year. 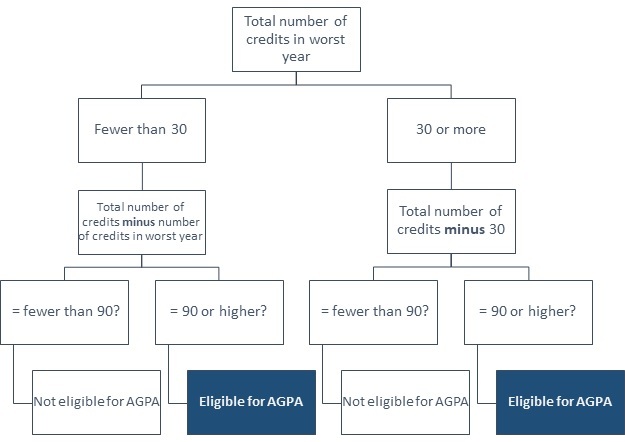 This means your AQ score can change even if your OGPA/AGPA stays the same. NAQ Score = The score given for the non-academic portions of the application, converted to a number out of 50. In order to make sure applicants receive a fair score for this section, all file reviewers are carefully trained, there are various checks throughout the process to ensure consistency in marking, and the NAQ score is standardized to make up for any scoring variations between reviewers. Due to these safeguards we do not accept requests for re-evaluation of the non-academic section. Please note that while we look for the same aptitudes and qualities each year, we periodically revise how we evaluate and score these qualities. Additionally, every year there are changes in the applicant pool which affect the scoring of the non-academic section. These include the competiveness of the pool, the addition or deletion of activities from an individual’s application, and adjustments made to the average candidate profile that reviewers use to help evaluate the non-academic sections. Therefore, NAQ scores may fluctuate from year to year. TFR Score = AQ Score + NAQ Score. Your TFR score might be really close to the cutoff. We have double-checked these files for accuracy, so unfortunately, you might just be one of the unlucky ones whose score is really close but not quite high enough to get an interview this year. I was not invited for an interview; can I talk/meet with someone to discuss my application? I would like some more feedback. Due to limited resources, we regret that we are not able to offer any feedback advising to applicants who were not granted an interview, nor can we provide any further information about the evaluation of your file. More information about scoring can be found on our Evaluation Criteria page. Reviewing the Interim Statistics on our Statistics page may also help you to identify some potential areas of improvement in your application. I can tell why I didn’t get an interview, but how can I improve my scores? Unfortunately, we cannot give you individual feedback about improving your scores – each person’s situation and application is unique and we do not have the resources to offer this type of advising to applicants. In general terms, improving one’s AQ score seems fairly straightforward, in that the only way to improve a GPA is by taking more classes and achieving higher grades in those classes. It’s the related if/how/when/why/is it worth it type of questions that are much more complicated. You know your situation, capacities, future plans, and personal resources the best, and you are the best person to make this kind of decision. We cannot tell you what impact improving your GPA would have on your ultimate chances of acceptance. For NAQ, we look for several things when we evaluate the non-academic portions of the application: longstanding, meaningful commitments; leadership; service ethic and altruism; ability to work with others, especially people outside of your peer group; and diverse interests and experiences. We also recognize exceptional achievements in some areas. With NAQ it is important to remember that the applicant pool isn’t made up of the same people you might normally compare yourself against, like your classmates or coworkers – it is made up of highly accomplished individuals just like you. Unfortunately we cannot offer specific ways to improve your NAQ score. My AQ score seems too low for my GPA. The AQ score can look really low sometimes. This is a result of the conversion mechanism we use (which is confidential). The AQ score is a number that is meant to be compared to other AQ scores only; it doesn’t have much meaning on its own. Sometimes applicants will see an AQ score of 10 or something similar and will think we are giving them a 10% (an F). We’re not! Please try to use your AQ score for comparative purposes only. The GPAs published on the interim stats may be a useful comparison tool as well. Finally, as a reminder, as long as your OGPA or AGPA (if applicable) is correct, your AQ score is correct. I think that there has been a mistake in the academic evaluation of my file. The academic evaluation was based on the credits and grades entered by applicants. If you believe that there has been a specific error, please send an email via the application system detailing what you believe the mistake to be. Please note that some applicants entered wrong information – eg. did not include all courses, excluded failed courses or used letter grades instead of percentages. In these instances the Admissions Office had to correct these mistakes by verifying courses and grades on official transcripts. Therefore, there may be a discrepancy between averages calculated by an applicant and the grades as they appear on the Application Status page of his/her application. The calculation of the AQ Score is automatically performed by the application system, so as long as your OGPA or AGPA (if applicable) is correct, your AQ Score is also correct. I am a re-applicant. I have not taken any further coursework so my OGPA/AGPA is the same (or I have taken further coursework and my OGPA/AGPA is higher than last year), but my scores have gone down. Why? For the academic section of the application the actual evaluation criteria remained the same and there were no changes to the grade conversion tables used. However, academic scores, like non-academic scores, are standardized against the current applicant pool. You can check your AQ score by looking at your OGPA or AGPA (if applicable): if your OGPA/AGPA is correct, your AQ score is also correct. I thought I should have been eligible for the AGPA to determine my academic score, but it does not seem to have been used. If the applicant was eligible for the AGPA, the application system automatically removed up to 30 credits from the worst academic year. Please note that the AGPA is based on completed courses with grades only, and does not include summer 2018 courses. The Admissions Office verified that grades had been entered accurately by comparison with the official transcripts. My overall GPA (or adjusted GPA if applicable) is slightly below the 75%/85% cut-off but I still feel my non-academic experiences are very strong and should have been reviewed. Although we look for excellent non-academic qualities, these must also be accompanied by very good academic qualities to demonstrate an applicant’s ability to successfully handle the rigorous MD Undergraduate curriculum. It was determined that a lower AQ score (below 75% for BC and below 85% for OOP) cannot be offset by a strong NAQ score; hence these files were not reviewed. I attended a university that did not use percentages for its grading scheme. How did UBC calculate averages from universities with different grading schemes? Information on grade conversions, including our grade conversion tables, can be found on the Evaluation Criteria page of our website. I am not happy with the non-academic score I received. Can I request another review? We understand that you may be dissatisfied with the scoring of the non-academic portion of your file, but would like to assure you that the non-academic portion of your application was reviewed and evaluated fairly and consistently. We will not re-evaluate the non-academic section of your file. At the beginning of each cycle, with guidelines provided by the Admissions Policy Committee, we establish a profile of an average applicant as a benchmark and points are allotted accordingly. Reviewers are trained and files are cross-checked. Although there cannot help but be a degree of subjectivity involved, we feel the standardized process keeps this to a minimum. I am a re-applicant. I feel I have more activities, volunteer, and employment experiences than last year, but my NAQ score has not increased. Why? Each year, the applicant pool is different, as is the average applicant profile used by non-academic evaluators. In addition, while we look for the same aptitudes and qualities each year, we periodically revise how we evaluate and score these qualities. All of these may contribute to a lower-than-expected NAQ score. I was not invited for an interview and would like to appeal the decision. We realize the importance of your application and appreciate that the results may be disappointing. Please be aware that we do our best to ensure that our evaluation practices are fair and consistent. Files are often double and sometimes triple checked to ensure accuracy. While we are unable to discuss your application over the phone, you may message Admissions through the application system if you have any specific concerns regarding your file evaluation. Please note that we will not re-evaluate the non-academic section of your file. We will not make appointments with the Dean, Associate Dean, or Admissions staff to discuss your application. I’m not sure if I am seeing the right thing under the scores line on my Application Status page. 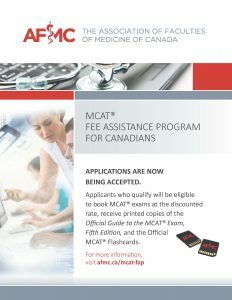 The Association of Faculties of Medicine of Canada (AFMC) is extending their MCAT Fee Assistance Program for Canadians. 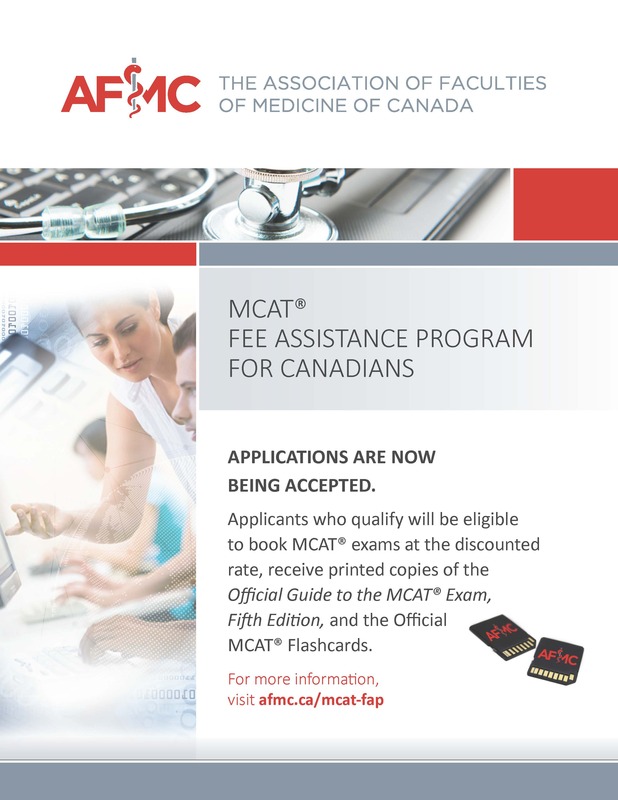 This pilot initiative offers reduced scheduling, rescheduling, and cancellation fees to eligible Canadians who would otherwise not be able to write the MCAT. For further information on this program, please visit the AFMC website. Ready to apply? The application can be found here. Please direct any questions regarding this program to service@afmcstudentportal.ca. The September 14 deadline is tomorrow and a large number of transcripts are arriving at the Admissions Office. Please read below for an update on transcript processing and other document statuses. Notes: To find out if your transcript has arrived, at least one entry for each institution must be started on the Transcripts page of the application. Once this is done, we manually update the status of your transcript when it is received and added to your file. To view the status of your transcripts and other documents, log in to your application and click on Application Status. Due to transcript volume we cannot check if your transcript is in the office. We will not respond to messages about transcripts being received or not received. You must make the decision to send another transcript (preferably via courier) or wait and see if your transcript arrives. All transcripts must arrive at our mailing address by Friday, September 14 at noon Pacific time or your application may become ineligible. Please note that not all transcript statuses will be updated by the deadline. We will send another email about processing times after the deadline. Important: If you sent your transcript by courier and have proof that your transcript was delivered more than 3 business days ago to our mailing address, please message us with the tracking information. These are updated daily, but as long as you have marked the box in the Transcripts section asking us to transfer your transcripts to your new file, you can consider your carried-forward transcripts received by the deadline even if the status for these transcripts says “Not Received.” You must submit a new copy of any transcript that has changed since you last submitted it. As long as you have uploaded your currently valid BC Services Card by the September 14 deadline, you can consider your proof of BC residency to be received on time, even if your BC residency status says “Not Received.” As a reminder, proof of BC residency will not be carried forward to your new file. BC residency statuses are updated daily. Please complete the MCAT page of your application and log into your AAMC account to send your scores to UBC using the MCAT Score Reporting System by October 1 (please send your scores now if they are available). It is not enough to complete the MCAT page of your application; you must also send your scores to UBC using the MCAT Score Reporting System. UBC is not part of the AMCAS system. We are currently updating MCAT scores once per day. If your English courses are not on the English Course Chart listed on our website and you have not received prior approval of your courses, please upload the course syllabi to your Documents tab. When your file is reviewed in the fall, you will be contacted if there are any issues with your courses. Due to the upcoming deadline it is not necessary to message us. We are happy to report that the class of MED 2022 is full and classes are underway! With classes starting, it is time to move forward to 2018/2019. We look forward to reviewing your applications soon. As a reminder, the application deadline for 2018/2019 is Friday, September 14th.